An independent laboratory test of popular dog food brands, commissioned by Environmental Working Group, revealed that the food we buy for our pets contains high levels of fluoride, a contaminant that may put dogs' health at risk. Eight major national brands marketed for both puppies and adults contained fluoride in amounts between 1.6 and 2.5 times higher than the Environmental Protection Agency's maximum legal dose in drinking water, and higher than amounts associated with bone cancer in young boys in a 2006 study by Harvard scientists (Bassin 2006). All 8 brands contain bone meal and animal byproducts, the likely source of the fluoride contamination. Scientists have not studied the safety of high doses of fluoride for dogs. Fluoride levels ranged between 7 and 11.2 milligrams (mg) of fluoride per kilogram (kg) of dog food, with an average of 8.9 mg/kg in the 8 contaminated brands. In contrast, 2 dog food brands, one with vegetarian ingredients and one made by a small manufacturer, did not contain detectable levels of fluoride. Notes: Fluoride content of 10 brands of dog food as determined by Covance lab (Madison, Wisconsin) using method 944.08 (AOAC International). ND* - below the method's limit of detection (less than 0.2 mg/kg fluoride). While scientists have not determined how much fluoride is safe for dogs, they have found that people who consume excessive fluoride often develop mottled teeth (dental fluorosis) and weakened bones, leading to more fractures. High fluoride consumption is also associated with reproductive and developmental system damage, neurotoxicity, hormonal disruption, and bone cancer (NRC 2006). Most of the fluoride contamination in dog food comes from an unsavory mix of bone meal and various meat byproducts added to dog food. The 8 high-fluoride brands list ingredients that include chicken by-product meal, poultry by-product meal, chicken meal, beef and bone meal; these are basically ground bones, cooked with steam, dried, and mashed to make a cheap dog food filler. A smaller amount of fluoride in dog food comes from fluoridated tap water used to prepare the food at pet food plants. Fluoride occurs naturally in the earth's crust, rocks, and soil, and in some water supplies. But two-thirds of Americans — and their pets and livestock — are exposed to the chemical via tap water that is artificially fluoridated in an effort to prevent tooth decay (CDC 2006). Fluoride is also found in certain foods, either due to processing or from natural accumulation by the plants grown in high-fluoride soils (Buzalaf 2004; Fein 2001; Heilman 1997; Jackson 2002; Rodrigues 2009). Once ingested with food or water, fluoride accumulates in bones. Topical application of fluoride on teeth is a common and effective means of preventing tooth decay. But ingested fluoride is well known to damage teeth and the musculoskeletal system (NRC 2006). Three studies show that boys who drink fluoridated tap water between the ages of 6 and 8 face a heightened risk of osteosarcoma, the rare but deadly form of bone cancer associated with fluoride (Bassin 2006; Cohn 1992; DHHS 1991). Scientists suspect that boys' rapid growth may make them more susceptible to bone cancer (Bassin 2006). Dogs may be even more vulnerable to osteosarcoma than humans. More than 8000 osteosarcoma cases occur in dogs each year in the U.S. and the actual number is probably higher, since not all cases are confirmed and registered (Mueller 2007). In contrast, osteosarcoma incidence in the U.S. population is 0.3 cases per 100,000 (NRC 2006), adding to approximately 900 cases annually. Thus, nearly 10 times more osteosarcomas occur in dogs compared to people. A dog drinking adequate water would be exposed to 0.05-0.1 mg fluoride per kg of body weight daily, depending on the dog's water consumption. 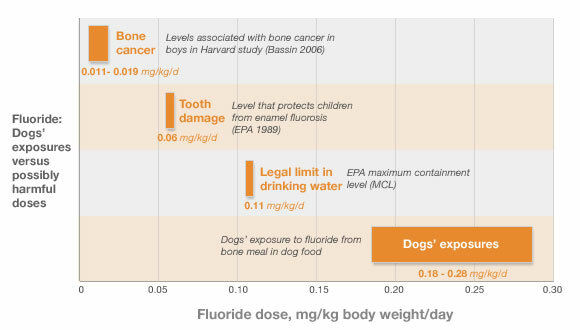 A 10-pound puppy that eats about a cup of dog food a day would ingest approximately 0.25 mg fluoride/kg body weight/day based on average fluoride content in the 8 contaminated brands tested by EWG. At that rate, the puppy would consume 2.5 times more fluoride than EPA's legal limit in drinking water. When fluoride in drinking water is taken into consideration, a 10-pound puppy would be exposed to 3.5 times more fluoride than EPA allows in drinking water. Large breed puppies may be exposed to even more fluoride. Whatever the size and the appetite of a dog, combined fluoride exposure from food and water can easily range into unsafe territory. And, unlike children, who enjoy a variety of foods as they grow up, puppies and adult dogs eat the same food from the same bag every day, constantly consuming more fluoride than is healthy for normal growth. Routine exposure to excessive fluoride can predispose dogs to health problems, along with high veterinary bills, later in life. Notes: Fluoride dose corresponding to legal limit in drinking water (MCL of 4 mg/L) was calculated using EPA's default daily water intake rate of 2 L for a 70 kg adult (NRC 2006). 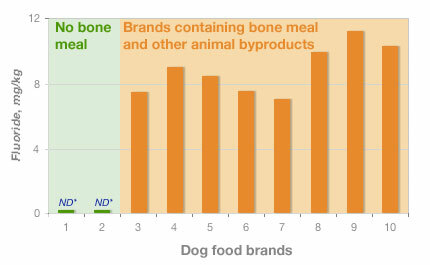 Dogs' exposures to fluoride was calculated from fluoride concentrations in EWG's commissioned testing and recommended feeding amounts listed on dog food brand packaging. Food and products for pets receive little government oversight. They are subject to few standards or regulations. This situation may put pets’ health at risk. Americans have a right to expect pet food to be held to health and safety standards similar to those for human food, and to be free from contaminants that endanger pets' health. Yet, when it comes to finding pet foods free of dubious food additives, chemical pollutants or untested ingredients, pet owners are largely on their own, since the agency in charge of pet food oversight, the federal Food and Drug Administration (FDA), has little authority and few resources to ensure that products produced for pets are safe (FDA CVM 2007). Pets are sentinels for all of us. The widespread contamination of pet food illustrates the urgent need for standards that require companies to prove their products are safe before they are sold. Updating public health laws to reflect the newest scientific research is a critical step to protecting the health of all members of American households, whether they walk on two legs or four. To protect pets from excessive fluoride exposures, dog owners can purchase pet foods that do not contain bone meal and other animal byproducts. To safeguard the health of pets nationwide, the government should establish fluoride limits in pet food that would protect both puppies and large breeds more vulnerable to bone cancer. Official Methods of Analysis of AOAC INTERNATIONAL (2000) 17th Ed., AOAC INTERNATIONAL, Gaithersburg, MD. Method 944.08 determines total fluoride content in a variety of samples, including fats and oils, raw materials, plant tissues, bones, water, and many types of foods. Fluoride is extracted from the ashed sample using perchloric acid distillation method. Fluoride levels are then determined using colorimetric detection method.